Sunset and heavy Rains, the Dead Sea, Jordan. 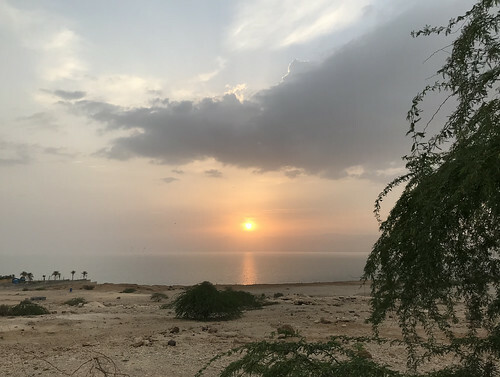 Home » Photos » Sunset and heavy Rains, the Dead Sea, Jordan. True, I'm around the Dead Sea for the second time. What is the probability of getting heavy rains in this area? I will try to return to the beach tomorrow for the third time, but I will have to give up the Eastern Desert Castles, bordering Iraq. Rainfall is scarcely 100 mm (4 in) per year in the northern part of the Dead Sea and barely 50 mm (2 in) in the southern part. The Dead Sea zone's aridity is due to the rainshadow effect of the Judaean Mountains. The highlands east of the Dead Sea receive more rainfall than the Dead Sea itself.